Star Stable allows players to adventure across the beautiful island of Jorvik upon the back of their very own horse in this virtual horse MMORPG. Filled with various horses, customization, adventures and social activities the game offers a lot, but at what price? Check out this Good & Bad for the answers! Free To Try - Players can download and play the game for free and are able to experience some early game content before they cannot continue progressing, but can still continue playing. Dozens of Horses - With a range of different types and colours of horse players have a nice collection of horses to collect; players can ride their horses, tend to them and race them with friends. Story-Quest Content - Players will find themselves as the main character to an extensive story-arc spanning multiple locations where they are working for various NPCs as the "Hero" trying to help them out. Virtual Pet - The game in many ways is a virtual pet MMO with players able to simulate what it is like to have a horse of their own; without constant care and attention with feeding, grooming and watering a horse grows particularly unhealthy and unhappy and gains penalties. Intuitive Controls - Controlling your horse is not only simple but also really effective, able to quickly tap your direction and increase speed without constantly holding down the forward button making controlling your horse more casual and fun. Subscription Based - The early "Free to Play" content is a pretty limited trial, players can only get up to level 5 but from then on have to spend cash to play the game and either subscribe or pay for a lifetime membership. VIP Members - Whilst the game is subscription only and has exclusive member shops, there's even an exclusive shop to just Lifetime members, which kinda seems like whilst paying members are important; lifetime members are even more important. Unskilled Races - Horse Racing plays a big part of the game, with players competing for the best times; unfortunately the courses are simple enough to memorize and find the perfect lines to run, so whoever has the best gear will always get the best times. Premium Heavy Content - Even though the game is a subscription based game there is still a lot of content, horses and gear that is premium content and requires earned or purchased premium Star Coins currency. 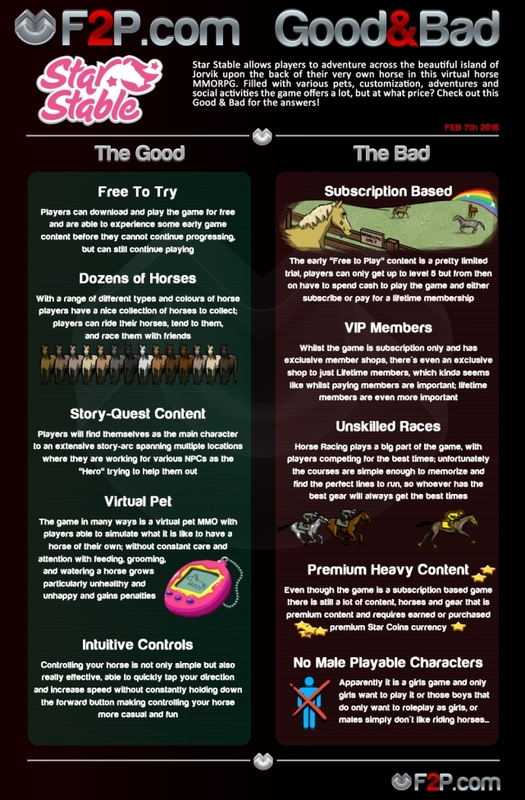 So that's what we think is Good & Bad about Star Stable Online, let us know what you think about the article or the game in the comments below.